When I decided to re-craft my blog during my move from Blogger to WordPress I chose some categories that I thought would be the most useful for my mom’s lifestyle blog. When I chose to call one “acting/modelling” I was pretty sure it would be used to follow Emma, my eldest daughter, in her trials and tribulations of slowly inching her way into that world. I had no idea I would be able to apply that category to myself and my new drive to be an actor, even if it’s just an extra. The fun thing about extras is there’s a lot less pressure! So while I wait to hear back about the Boneyard job – or at least have the option to be an extra in the film – I went and spoke with another director of a different film about working on his project. This production company is Slinger Pictures and this story sounds hilarious. It’s a film about a tourist group in Kingston, but the town is being overrun by demons (I hope I’m explaining the basic plot right.) The joke is that the tourists drop off one by one during their group tour and no one notices. I think maybe the director guy explained it better, but it sounds like it’ll be a blast to film. I don’t know about Boneyard, but this second film, Sir John A and the Curse of the Anti-Quenched, is a just-for-fun unpaid extra part. 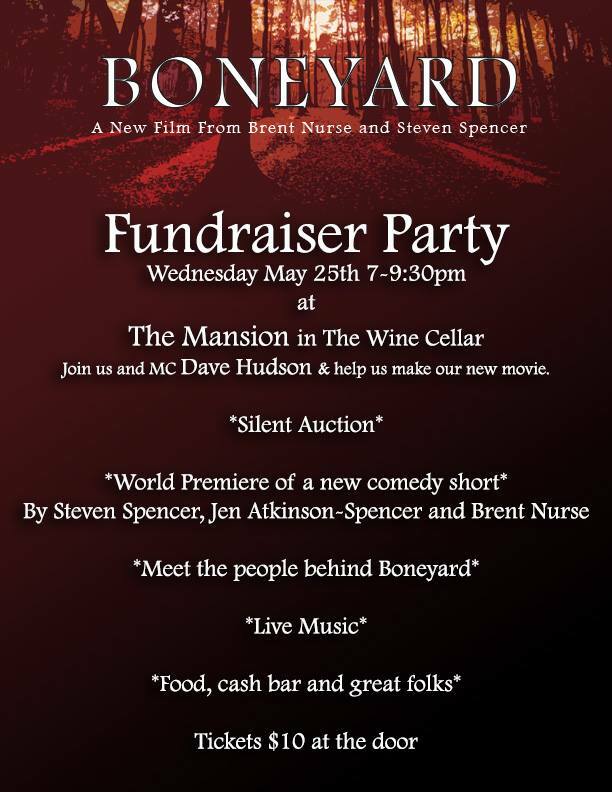 The Boneyard film is having a fundraiser next week to, well, raise funds for the movie. If they tell me I’m in for an actual part, I will do my best to get to this party, but it’s during Emma’s dance time which means extra hassle for Pat and the girls if I’m not available. I’d love to show my support, but not at the expense of my family. I only stumbled over these films while trying very hard to get Emma some exposure in the dramatic world. Mode Elle isn’t having much success getting Emma any jobs (or auditions) so I’m hoping to find her some things locally that she can do, or courses she can take to help her expand her theatrical experience. And on the way to helping her, I’ve found my drive to be an actor as well! I just think it would be loads of fun to see myself on film, and work with talented local people and make those connections that may work for both Emma and myself going forward. Edit: The film Sir John A and the Curse of the Anti-Quenched is playing at the KingCanFilmFest this year. I’m so excited! Boneyard is there too, but they’re on the same day and I really can’t manage both. That is awesome! How funny that along Emma’s journey you have found your own love for acting. The film looks good as well, although I’m not really into horror movies! Please do let us know what happens next in your acting journey. ; ) Thanks so much for linking up with #StayClassy! I don’t go out of my way to watch horror flicks, but beggars can’t be choosers, right? 😉 Anyway, of course I will post about how things are going – especially if I get to be in one or both of these films. I’m so interested in the process of filmmaking, as well as actually being in it! Thanks for the comment. Thank you – I’m still waiting to hear (maybe not a good sign…) but glad to find someone who likes horror flicks! We did lots if extra work when my eldest daughter was young and got paid. She was in Fly Away Home along with her cousin. It was filmed in Port Perry. Most of the filming we were in was shot in Toronto. We were in St.Elsewhere – boy am I old! Plus several made for TV movies. When looking for an agency do NOT go with an agency that wants big money up front. Actually we were with two agencies and neither took up front money – they just got a portion of our earnings, so they had a reason to really find us work. For head shots, we went to Walmart and used the tips on the ACTRA website for poses. Do NOT get scammed by photographers modelling or acting schools posing as talent agencies. If you want acting lessons, go to an acting school, modelling lessons? Modelling school. Photos? Go to a photographer. Agencies that falsely advertise are cons and will play on your weaknesses. They will nickel and dime you down the garden path holding out that elusive carrot of a potential job. Read the ACTRA website for more tips on avoiding scams. Thank you Suzanne for sharing how your acting was. And St. Elsewhere? That was a few days ago… 😉 I’ve learned a lot through our experiences. Unfortunately we don’t have many agencies here in Kingston so right now I’m just going to wing it and see what I can stumble over. I really do appreciate your candour and your thoughts on the matter. If I remember correctly you had a great comment on my Mode Elle post as well. I’m getting Emma into some community theatre this summer so maybe she’ll love that and we’ll find her some stage work going forward! Thanks again!